Hello all! Scott again. I wanted to share a story from the medical ward. The patient I want to share about is a patient whom I will call Harrison. Harrison is a delightful young man in his early 30s who came to us with considerable shortness of breath and hypoxia (low blood oxygen saturations). After taking a history, performing a physical exam, reviewing his chest xray, and having his sputum evaluated in the lab, we diagnosed him with tuberculosis and started treating him for this. Incidentally, his labwork revealed severe kidney failure. The kidney has many jobs, including getting rid of potassium and maintaining an optimal pH (acid-base status) in the body. Since his kidneys were failing, he had a profound elevation in his potassium, and was severely acidotic. The cause of his kidney failure was quite unclear, and our investigation did not reveal a cause. Unfortunately, despite our initial treatment approach, his kidney function had worsened the next day, and his potassium level and pH had reached dangerous levels. At this point, seemingly the only available option was dialysis. However, in Kenya, dialysis is only offered in two cities, and is extremely expensive, with few able to afford it. I explained to him that without dialysis, I was worried his heart would develop an arrhythmia and he would likely not survive (this is what commonly occurs when potassium reaches his level), and his ECG was already showing abnormalities from his potassium. We next had a family meeting with his wife, brothers, sisters, and parents. He and his family are primarily farmers, and were already in hard times financially as much of their maize (corn) crop had been wiped out by a fungus. They determined that if they sold a few of their cows, they would be able to raise enough money for at least three dialysis sessions with hope for eventual improvement in his kidney function. I hated to put his family in financial hardship, but he was so young, and I was really hopeful that dialysis would possibly be merely temporary if his kidney function improved. I called the referral hospital in Eldoret, a city a few hours away to arrange the transfer, but they said it would be several hours before they would be able to accept him. Next, I updated the family on the situation and told them it would be a few hours before he would be able to be transferred. By this time, I had developed a nice rapport with the patient and his family and we discussed various other life issues, which was made easier by their excellent proficiency in English. He and his family were people of tremendous faith in the Lord, and they were trusting God for a miraculous healing, and trusted that his will would be done. Before I left, they asked me if I would be willing to pray for him. Here at Tenwek, we commonly pray with our patients, but it struck me that despite knowing he was very ill, I had not taken the time to pray for this patient. I proceeded to pray, and I must say, while praying something came over me. It was as if words were coming out with such ease, and with more confidence than I had ever prayed. I knew from a medical standpoint, based on everything I have ever learned and experienced, that urgent dialysis was needed. Yet, for some reason, I thought God was revealing his glory through this patient. After praying, I left and prayed again by myself for God to intervene for this patient. I sensed he was moving, so I grabbed a needle, and lab tube, and went back into the patients room to re-draw blood to recheck his kidney function (even though we had just checked four hours earlier). I brought the tube to the lab, and just waited in the lab for the results to return. In my head I knew it was silly to expect his kidney function to suddenly improve without any intervention, but yet I held onto that glimmer of faith, that maybe, somehow, God was actually really going to intervene. Anyways, 30 minutes later, the technician had finished running the sample. He handed me the printout of his labs. My eyes went right to his creatinine, which the lab we used to measure kidney function…the higher the creatinine, the worse the kidney function. His creatinine had dropped by more than half, meaning his kidney function had more than doubled! Additionally, his potassium levels had considerably dropped,and his acidosis was much better!! I honestly could not believe what I was seeing with my eyes! This sort of thing does not just happen. With essentially little to no treatment, over those past four hours, his kidney function suddenly and rapidly improved. There was no medical explanation for what I was witnessing, and only God could be behind what was happening. I was so excited to tell the patient the results, however, on the way back to his room, I honestly was overcome with emotion. I will admit that I found a bathroom, locked the door, and just broke down after experience the glory of God revealed in this way! Finally, I gained my composure, and delivered some of the best news I have ever been able to share with a patient. There was so much joy in that room, and we all gave thanks to God for what he had done. We cancelled the transfer to Eldoret as he no longer required dialysis. I eventually left the room, did several fist pumps and was able to proceed with the rest of the day. I will never ever forget those moments, and my faith continues to expand in new ways. The Tenwek motto indeed was true…We treat, but Jesus heals! I am happy to say that over the next 48 hours, his kidney function completely normalized, his potassium levels are normal, as is his pH. Also, he was weaned off oxygen and is completing his TB treatment. He returned yesterday for his 10 day followup from discharge, and continues to do amazingly well with absolutely no symptoms. Praise God!! As I left the hospital that day, a motorcycle taxi (called a boda boda) crossed the road right in front of me. Many of the boda bodas will have a message of some sort on the rear of the bike. This particular bike had on its bumper, “Jeremiah 33:3.” When I got home, I read this verse which reads, “Call to me and I will answer you and show you great and unsearchable things you do not know.” This was such a fitting verse to end the day, and I am sure it was God’s way of reminding me to continue to call out to Him, and he will continue to reveal himself to me in new ways! Thanks again for reading and sharing with me in celebrating another Miracle at Tenwek! I have another incredible story from just today of a really amazing recovery in one of our patients, but I will save it for another time. God Bless! 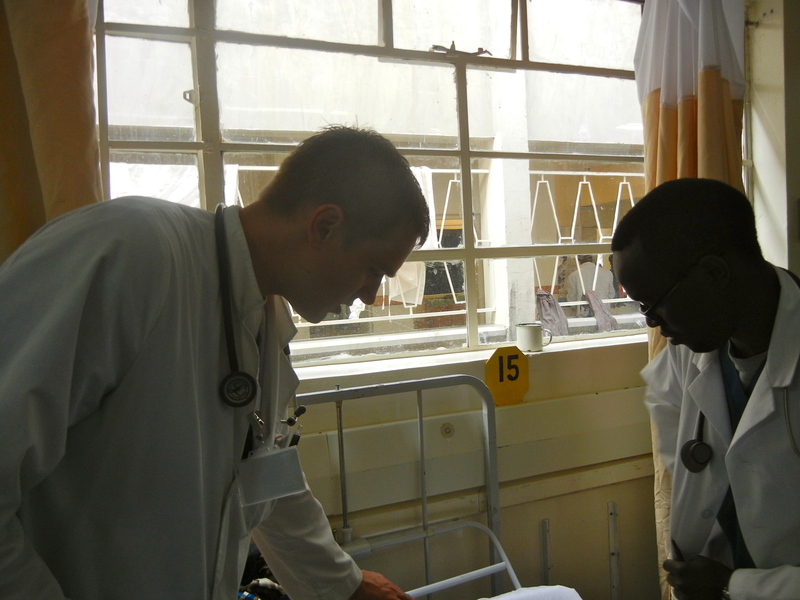 Myself and Dennis, a Kenyan intern, rounding on the medical ward.